Professional Web Services provides the 24 x 7 x 365 B2B and B2C technical and professional business sales and strategic marketing solution to get your business and website found on the Internet. Can you afford to wait to get your website found online? Find out more now. 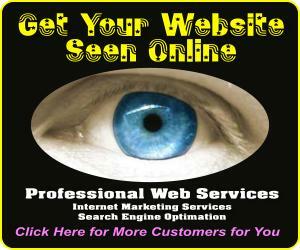 Internet marketing requires a smart multi-prong approach to getting your website found online. Proper marketing strategies should begin with good website fundamentals, good website structure, secure B2C e-commerce, and effective B2B website designs. Then integrate quality links and relevant content for the online visitors and the search engine crawlers to find. Supplement this with effective product advertising campaigns and creative ad copy to extend brand market reach and branch out to new online market segments. Learn how Professional Web Services can improve your site design, while providing an increase in customer web traffic, provide a great source for quality lead generation, expand market reach into other markets, plus we will show you how to integrate cost effective ways to increase company sales with effective online marketing services and best practices email campaigns. Our professional web services team works closely with clients, in order to have a full comprehensive understanding of the important details of their industry. Evaluating these key details are necessary in providing proper world class site designs. Once we obtain detailed knowledge of what clients do, and define and identify who their customers are, this enables us to develop a smart plan, reworking, optimizing, or starting fresh, bringing a site up to world class standards, thus improving their search listing position. We can demonstrate how revenue will grow from new targeted consumer or business visitors, driven there by all major search engines. A proper Internet marketing/advertising campaign strategy should target prospective customers with pleasing, informative visits, utilizing proper landing page designs. This is very important when providing good B2C marketing strategies to consumers or other organizations. We apply appropriate enhancements, quality links, continual maintenance improvements, add well placed graphics plus creative copy, while obtaining the highest number of relevant B2C and B2B traffic hits from search engines. For example, when business to business, B2B B2C, Business-to-consumer e-business sites today become burdened with outdated information, and remain non accessible to search engines results pages for their critical keywords, they are probably losing market share nor are they growing at full potential. Web sites that stay current, adding updated information, will save on company expenses, increase traffic, revenue, & improve the bottom line. The only way we can be successful is have our client’s experience profitable lead generation dynamics from solid designs. Let us demonstrate what the results of our excellent global marketing plan can accomplish, with excellent ebusiness design ideas that improve sales and your corporate bottom line. Utilizing our technical backgrounds, effective & ethical advertising campaigns, & smart enterprise solutions, we look forward to working as partners, in what we hope will be the start of a long, mutually profitable, relationship. We guarantee improvement for our client in their online market position search listings, for pertinent keywords & phrases critical to their business, by improving the inherent foundational design. Our team can help your corporation gain online worldwide prominence with great designs. To obtain a no obligation Internet marketing evaluation and online advertising consultation plus in-depth planning assessments, Professional Web Services for your global online solution today. Professional Web Services is here to help your website become a quality online leads generator and increase your bottom line business sales results.